An unlikely Italian band on the Harvest EMI imprint, Gruppo d'Alternativa manage to fly under the radar for many RPI collectors. 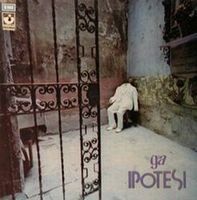 Often described as "proto-RIO," Ipotesi is the musical equivalent of performance art; in fact, the album was originally conceived as a theatrical production based on the death of singer Tino Guasconi's friend. The vocals may be repellent for some, as Guasconi has a nasal voice that cuts through most of the accompaniment. The quality of his voice does not bother me personally, but it is mixed a bit too loud and tends to drown out the other instruments. Along with the typical guitar, bass and drums, Gruppo d'Alternativa uses keyboards and woodwinds to fill out the highly complex and intricate arrangements. Ipotesi is unlike anything I've heard and is somewhat difficult to describe, and belongs in the Avant-Prog category for that reason. Initial listens will be confusing, but Ipotesi reveals its genius in due time and stands as one of the essential examples of the genre. It does not however match the best work of Picchio dal Pozzo or Stormy Six, and therefore can only earn four stars. Ipotesi is a relatively short album (35 minutes), and is presented like a disjointed set of puzzle pieces that don't quite fit together the right way. This schizophrenic quality does not detract from your enjoyment of the album however...but dictates it. Listeners looking for an immediately contagious experience are not going to find it here. Gruppo d'Alternativa clearly admire the improv greats, and evoke the attitude but not necessarily the methods of Miles Davis or Soft Machine. What Gd'A were doing here did not have a name yet, and I am amazed that such an unmarketable group would find release on a major label like Harvest. The BTF/AMS CD issue is excellent as always, although maybe not given the same loving care and attention more mainstream titles have been given. There is noticeable static in the right channel; what is obviously an LP-sourced master was used which surprises me considering that the master tape should have been available. But the music itself is what matters most, and Ipotesi wastes no time in delivering a quality auditory experience. "Quando le Parole" briefly heralds the album by going in no less than three distinct directions, before settling abruptly into the awkward "Incidente." Before you have time to adjust, the song shifts gears to a more familiar 4/4 rock foundation. This only lasts a minute as a call-and-response between organ and flute introduce the "Infanzia" suite. Part "a)I Movimento" uses triplets repeatedly and with variation, primarily demonstrated with an extended piano monologue. This segues into the surprisingly beautiful "b)II Movimento" or Second Movement. Acoustic guitars shine in an unexpected Prog Folk diversion and Guasconi's singing suits the melody perfectly. "Voglia di Essere" introduces a descending riff before again morphing into an experimental aside, which itself abruptly ends and is replaced with a new musical idea. Moments of brilliance on Ipotesi are many, but are so brief they may be easy to miss. Take for instance the figure between 1:19 and 1:24 - most bands could write an entire song around this one pattern - Gruppo d'Alternativa only relies on it for five seconds. "Solitudine" has a celestial quality that quickly fades pending arrival of a tritone figure between guitar and bass. Flute and bassoon join in for some Zappa goofiness before transitioning to a Canterbury jig...then the whole thing repeats, but in overdrive. This amazing composition may be the best distillation of Ipoteosi if you had to convey it in five minutes or less. "Appare la Forma" starts out with a playful bass line that anchors an extended jam. After two minutes though, Gd'A have moved on to other challenges, pairing a dissonant guitar chord with an opposing flute melody. The long "La Tua Lotta" is built around a repeating scheme of alternating time signatures and well-timed pauses. "Messaggio Libero" revisits folk inspiration briefly, but quickly collapses into a cacophony of seemingly improvised yet carefully orchestrated ensemble work. At times the individual members seem to have their own agendas but somehow this selfish nature is selfless at the same time. Finally, the song "Ipotesi" uses only guitar and voice to make its point, and ends with no sense of closure. To do so would be condescending to the listener. Ipotesi needs no ribbon around it; this imperfect present is wrapped up in its own unique package, ready to be opened.